Castlefield Gallery (CG) is excited to present artists Vasilis Asimakopoulos and Christian Falsnaes for its annual Head to Head exhibition. For 2016 CG will be reworking the format of the Head to Head, consecutively handing the gallery over to one artist at a time to each produce a solo presentation, providing an opportunity to see work by two innovative artists who approach their practice from distinct perspectives yet share overlapping interests in the nature of participation, event, and social ritual in the context of exhibition space. Asimakopoulos’ work seeks to explore the common ground between landscape and event. Norwegian Concrete will include new work commissioned for the exhibition which will respond directly to the gallery space, using video and sound installation, wall-based work and sculpture to create a singular environment. Asimakopoulos will work with the gallery’s distinct architecture to accentuate the feeling of a harsh and desolate environment evoked by the brutal materiality of his work. Norwegian Concrete mixes direct references to heavy metal subculture and the rituals involved in its alternative social scene, with more abstract references to the Aegean Islands, salt pits and Portland stone quarries. The public preview (Thu 1 Sep, 6-8pm) will see Asimakopoulos involving audience participation in his work for the first time, contributing to an experience of primitive archaeology, amongst the detritus and aftermath of an undefined event. This will be the first UK exhibition of work by Berlin-based artist Falsnaes. 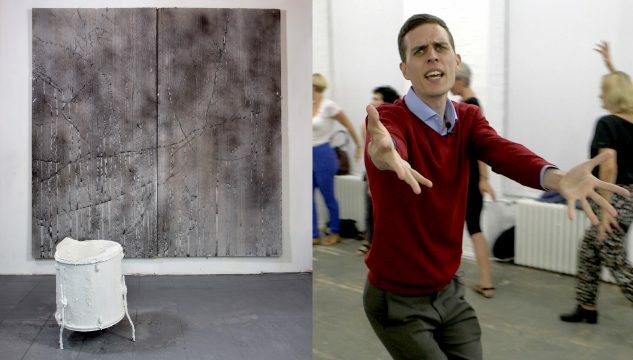 Originally from Denmark he has exhibited internationally, working with performance, painting, video and installation. Throughout his work he has designated the audience as his principal material. The formation of hierarchy and submission, the authority of the artist and the power relations between artist and audience are often revealed as central to the work. Considering how performance and participation work in an art gallery – where the context isn’t given, and must be negotiated differently than in a theatre, cinema or workshop setting – Falsnaes often produces situations in which participants are asked to become active agents in the creation of the work, usually without prior knowledge of what they will be asked to do. First, a new work commissioned by CG will see the gallery’s first visitors each day faced with the responsibility of creating content for the show, potentially resulting in an empty gallery for others. Castlefield Gallery would like to thank the Danish Arts Foundation for the funding contributed towards the exhibition First by Christian Falsnaes.